hi I am using AdvancedSense IQ 610 to analyse my indoor air quality . I always monitor room temperature , humidity level inside the room. I am using this from past 1 year and is working fine for me. Awesome thread to find! I've been keeping an eye on AirPi, but I'm concerned about the soldering requirements, bugs, and lack of calibration. I did a bunch of research today on alternatives, and it looks like Netatmo is the current best, at $145 for CSV export and the critical sensors (temperature, humidity, CO2) plus pressure, sound, and IFTTT support. Foobot would be second, since it has more sensors (temperature, humidity, CO2, CO, tVOC, PM2.5) for $199... Unfortunately, it doesn't have any export, nor an API, nor IFTTT support. Actually, looks like Foobot now provides API access - http://foobot.io/support/ (scroll down and click "API for Developers"). Unfortunately, neither device provides all of the readings I am looking for, so in the near term I will need to pull in/combine data from both devices. Anyone else want to weigh in on Foobot, especially comparisons of accuracy with other sensors? As far as $/sensors go, it seems to be the best available, but the Amazon reviews are extremely polarized between love and hate, with the haters citing both bugs in the apps (not too relevant to us since we'd be using the API, I suspect) but also claiming inaccuracy (a big concern). New project I missed: the 'Mpod'/'MAQS'. Homepage: http://maqs.pbworks.com/w/page/43556955/FrontPage Calibration/evaluation paper: http://www.atmos-meas-tech.net/7/3325/2014/amt-7-3325-2014.pdf Does not seem to be commercially available. 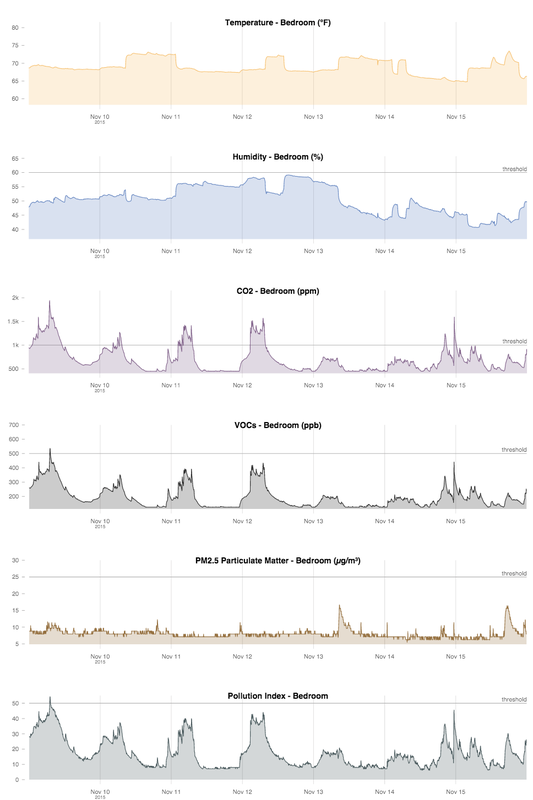 Also of interest: snuffles.org is a wiki attempting to collate air quality sensor data: http://www.snuffle.org/doku.php?id=m-pod&do=index Does not seem well organized so there's no page listing just devices. In a LW discussion of possible CO2 effects on cognitive performance, one user reports using a CO2/humidity/temperature meter. It doesn't have data logging, but there is a $170 version, the "TIM12 Desktop CO2 & RH/T Monitor/Data Logger" (data sheet). This is not as good a deal in terms of price per variables as some of the others, but perhaps it's worth the premium? CO is included in VOC's measurements, so there's no reading you can get for it. Regarding VOC/CO2, there's no specific CO2 sensor as it's a value deducted from VOC measurements and complex algortihms. I must tell you that CO2 isn't a pollutant - if not in too much quantity - but is a confinement index. So when it rises, it simply means you need to open windows. Not ideal, so if you want to dig deeper into VOCs you may have to combine the Foobot with some additional sensors. I'm hoping they ship it fast, it was only $79 so I thought why not? I bought this other little device called Atmo Tube, it's pretty cool and small but it doesn't offer air purifying, this iBaby Air has air purifying. Any other suggestions for now? What can I do to improve the air quality for now? I sometimes wake up coughing a lot, then the cough goes away once I leave to work. Speaking about air quality monitoring & health, there is another competitor to talk about: AirVisual. The app provides you with air quality everywhere you are, and the AirVisual Pro is a very efficient air quality monitor. Have you tried it? Looks like this device measures both PM2.5 and CO2, which is just what I have been looking for! @ejain I would definitively recommend it, I am using it for quite a while and it's working very well! It gives indoor and outdoor PM2.5, CO2 as well as other data (temperature, humidity...). You can read the data through the the monitor, the app, and it is collaborative because you can share this data to all AirVisual users in order to increase the worldwide data coverage. You can read the data through the the monitor, the app, and it is collaborative because you can share this data to all AirVisual users in order to increase the worldwide data coverage. I looked at their API, but as far as I can see you can only get the current measurements, so the device/service doesn't keep track of past measurements? Sure it does! 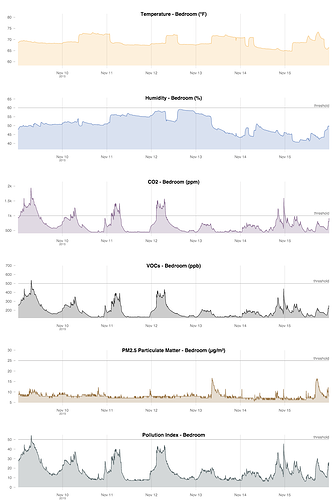 Take a look at these screenshots,it gives hourly, daily and monthly historical data on many metrics. Great! But can you export your historical data? Looks like you can get up to three years of data directly from the device as a spreadsheet. Exactly! All the monitor historical data is downloadable.